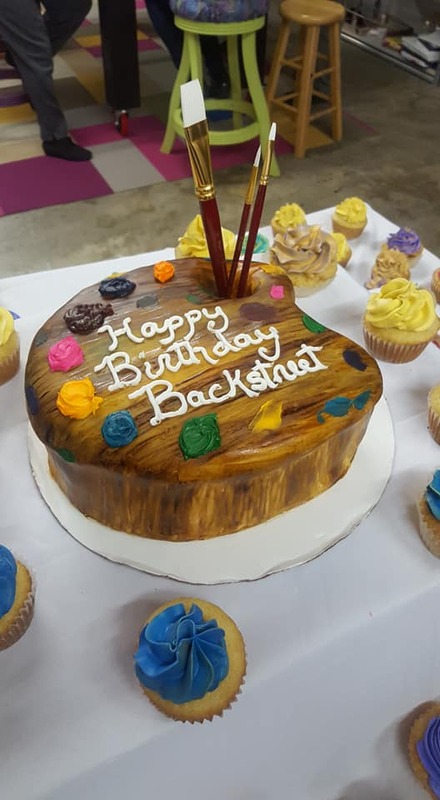 Yesterday was the first birthday of Backstreet Arts, the local free art studio created by Kim Ramey in order to provide a place where people of all descriptions could create. Our motto is ART SAVES LIVES, and for Kim it is literally true: her work pulled her through some tough times, and she wants everyone to be able to avail themselves of that same power. One year ago we opened our doors to any adult who walks through that door, and it's been a fantastic year. The studio is behind Bridging The Gap, a nonprofit serving the homeless in our community, and while everyone is welcome to come paint/draw/sew/et al., the thrust of the studio is to provide materials, space and instruction to those who would not otherwise have any access to art. Volunteers — local artists, many of them professionals — teach classes and supervise projects for our artists. Some are recurring classes; some are one-off events or short-term courses. The whole thing is supported by donations, either cash or in-kind materials, and to me that's one of the most amazing things about Backstreet. It doesn't matter what you're interested in doing, we have the materials and tools for you to do it. Oils, watercolors, pencils, fabric, jewelry, stamps, leathercraft, calligraphy, and even just plain coloring books — the place is crammed with stuff waiting to be used. Rent, utilities — even the original renovation of the space — all have been funded by donations and volunteer labor. It is truly a labor of love. I have tried for the last year to establish some kind of writers group, but it's been difficult. Our population tends not to be steady customers for the most part: their work schedules are irregular, their lives are easily disrupted, or they move on. Not very conducive to sustained writing. So at the moment I'm retrenching and trying to come up with quickie projects that I can provide to anyone who walks in the door, some one-shot deals that are engaging and that can be completed in one sitting. Then, if a writer becomes really interested in telling their story — my overall intent for the program — then I have a basis for sustained interaction. Wish me luck. I love this photo: I'm working with a young man I just met (Kim insisted we meet), Jen with her laptop is making notes on a novel she's been working on, while convincing my mother-in-law (out of frame, and whom I had taken down to the studio to get acquainted with it) to draw something and to create no matter whether she thinks she has any "talent." In front of me is a leathercraft project I just started, a cover for my WASTE BOOK, which I'll feature in an upcoming post. To my right is a table full of leatherworkers making honest-to-goodness satchels. Behind me are various paintings from other classes on their drying racks, and next to those is a shelf unit with leather and yarn. It's all just amazing. You should donate. And if you're in the Newnan area, you should come in and do some art. Here's the schedule.